If you were to ask most people in the world to name something famous in France, the chances are The Eiffel Tower would rank first for most but ask them to name France’s most famous product and the answer is almost certain to be Champagne. The famous wine takes its name from the region where it is produced and not, as many believe, from one of the grape varieties which go into the sparkling wine. Chardonnay, Pinot Noir and Pinot Meunier grape varieties are dominant in Champagne but the skill of the winemakers in this part of France is what really sets the wines apart from their many imitators. 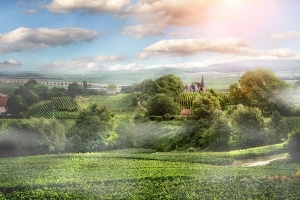 The Champagne “appellation”, less than an hour’s drive from the France Motorhome Hire depot, is the most extensive wine region in France – it spans a vast area from the Ardennes Forests in the north to its most southerly vineyards where it borders, Burgundy (where we are based). The landscape too is as varied as the wines produced here – from the vast open agricultural plains of the north to the steeper valleys of the southern regions, the land changes frequently and has a host of hidden gems to discover. In terms of natural attractions, Champagne has much to offer too but it is really the history of the wine and the wealth it brought to the area which make the history so compelling. As with just about every other region of France, there is no better way to discover the fascinating history here than by road – and no more convenient or relaxed a way than by motorhome or campervan. The road network throughout the region is easy to navigate and follow and seems to have been almost made with motorhomes in mind! There are campsites and motorhome service areas in almost every town as France extends its usual warm welcome to motorhome users – even “wild-camping” (picking virtually any spot you wish for an overnight stay) is easy since the area is sparsely populated so if you have no desire at all to share space in an official campsite, you will never be short of places to stay. Many of the winemakers are also members of the France Passion scheme – a network of privately owned sites throughout France where you are invited to stay free of charge for a night or two, often right in the heart of the winemaking action. All France Motorhome Hire vehicles come with free membership of France Passion for the duration of your hire and many clients tells us enthusiastic tales of the wonderful experiences they have had staying on a France Passion site. Many report having been invited into private winemakers caves (cellars) or invited to dine with the owners but one highlight from 2012 included a couple from Australia being invited to a French family wedding after holding an impromptu Barbecue the previous evening! For more details of this free camping option have a look at www.france-passion.com. As far as the route you might take once on the road in Champagne, of course there are too many possibilities to mention them all here but there are some “must see” highlights which are all easily accessible in a motorhome. You could start your journey at the northern most point of the region which would quickly take in the famous Champagne capital cities of Reims and Epernay and in fact, this concentrated area alone could easily take up a week of touring time to do the area justice. If your schedule doesn’t allow such a leisurely look at the one area, the highlights of Reims and Epernay are easy to find and can be visited in just a few hours – just don’t be surprised if you find yourselves wanting to stay longer! As always in France, the best source of information about a region comes from the local tourist board who can provide a wealth of information and ideas for visits and attractions in the region. Here is the link to Champagne region tourist board site, which offers all sorts of information from trials that you can follow to Champagne festivals: www.champagne-ardenne-tourism.com (the English version of the website is often not available so we’ve provided the French version). Visit the magnificent Notre Dame Cathedral where the kings of France were once crowned, now adopted as a UNESCO World Heritage Site. Pass a few hours people watching in the city centre – the main street is packed with lively bars and restaurants (all serving Champagne of course!) and its always buzzing with activity. Walk along the Avenue de Champagne, home to the most famous Champagne makers of the world. Here you will see the original estate Chateaux of all the famous Champagne houses – it seems like a fairy tale world of wine-wealth and the best part is that they all offer cellar visits with guided tours and tastings, often for free! Take the underground train ride through the cellars of Moet et Chandon or for a more intimate visit, call into the fabulous chateau of Verve Cliquot. The town centre of Epernay has a more intimate feel than Reims and the pace of life here is more typically French – here you will see the locals at work as the seasons unfold on another year of wine production. There are plenty of restaurants and bars to while away time in and a great traditional feel to the town. Epernay too, has an”Avenue de Champagne” with dozens of individually styled estate Chateaux dating back centuries standing as testimony to the wealth the locally produced wines has brought to this region. As a truly independent traveller (there can be no more an independent way to see France than by motorhome or campervan) you will be able to unearth some of the hidden gems of any region and one such must-see gem is the stunning underground quarries-turned-cellars of the Ruinart winery. Boasting the oldest cellars in Champagne, the Ruinart winery is open to small groups only and you MUST book in advance but the caves, excavated in the c12th for its stone to build many famous Parisian buildings, are truly spectacular and well worth the slightly pricey visit fee. Pretty much all the smaller Champagne producers are village based and you could lose a few very enjoyable few days simply trickling through the villages, meeting wine makers and tasting their keenly priced Champagne. Check to see if there are any tasting events in the region whilst you are there too (but remember to park up for the night before settling to the task, some village events have masses of wines to try all on one day!). Before leaving the area, be sure to visit the ancestral home of Champagne – the hill top village of Hautvillers with its c12th Abbey where the founder of Champagne – Benedict Dom Perignon – is buried. For a more eclectic visit and one which is well off the tourist trail but worth the effort for the views alone – call into the Perching Bar, near Reims – Champagne’s only tree top bar. As you leave the northern parts of the region, it becomes even more clear why this part of France is so rich in heritage and culture. The countryside continues to open up in front of you as you drive until you reach the next major towns of Provins and Troyes further south. Provins, with its origins in Medieval times, has been declared a UNESCO World Heritage Site and can easily distract travelers for a day or two. There are great places to stay here to with a motorhome or campervan too and as always, visitors are made to feel most welcome on the campsites and aires de service nearby. See www.provins.net for more details. The town of Troyes is an exceptional piece of architectural history where many of the wooden timbered buildings dating back more than 600 years remain intact and unchanged to this day. One of France’s largest man-made lakes is to be found on the outskirts of Troyes where the body of water has been developed as a major Nature Reserve (with its own dedicated campsites right on the waterfront: www.camping-lacdorient.com) whilst for those seeking a fix of “retail therapy”, Troyes also boasts the countries largest group of Factory Outlet Stores. The region is home to two important rivers too – The River Marne, a major tributary to The River Seine and The Petit Seine, the smaller brother of the river which flows through Paris, both rise in the Champagne region. Further south, the wine influence becomes a little less intense but none the less continues to dominate the commerce of the region. Towns give way to wide open countryside, dotted with the occasional spectacular Chateaux to remind you of the wealthy heritage of this vast region. In culinary terms, Champagne is not just about wine either. In keeping with the whole of France, the region has its own culinary signature and the best known dishes feature locally produced cheeses. The world famous Brie (the trade name for the cows milk cheese from the Nogent Sur Seine area) is at its best here and its worth stopping off at one of the regular farmer’s markets just to sample a truly local version of this most famous French delicacy. Whilst there, keep an eye out for its competitors too – the regional Langres and Chaource are stunning with crusty French bread and a glass of Champagne. Discovering this fascinating region in real detail could take weeks but without committing to driving great distances, it is quite possible to pass away a few days and to take in the real highlights. On the borders of the region in each direction there are other great parts of France to see without having to spend all day, every day in transit – as with all of France, the next must-see attraction can be literally just around the corner. The France Motorhome Hire base is the perfect starting point for either an extended trip through the Champagne region or a shorter visit since it is less than a two hour drive away and once there, there is much more to see than simply the millions of Champagne bottles on offer – the region cries out to be explored!